Prismacolor Premier Colored Pencils - SANFORD-Prismacolor Premier Colored Pencils: Verithin. Ideal for outlining, detailing, lettering and cleaning up edges. Hard, thin leads sharpen to a fine point. Has high quality pigments for rich color saturation. 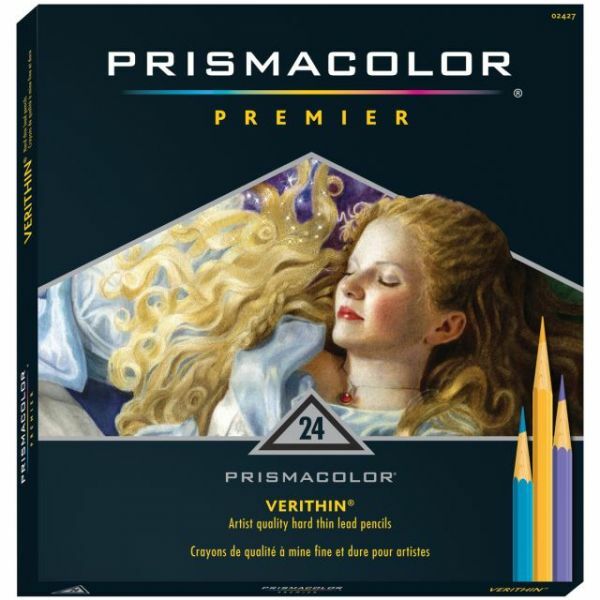 This package contains twenty-four 7 inch long lead pencils in colors VT 734, VT 734-1/2, VT 735, VT 735-1/2, VT 737, VT 738, VT 738-1/2, VT 739, VT 439-1/2, VT 740, VT 740-1/2, VT 741, VT 742, VT 742-1/2, VT 743-1/2, VT 744, VT 745, VT 745-1/2, VT 746, VT 746-1/2, VT 747, VT 752, VT 757 and 759. Non-toxic. Conforms to ASTM D 4236. Imported.